How do you wash dishes or wash your face at Granite Park Chalet? Is there a central place for the gray water? Or do you just scatter it, like at a backcountry campground? Seems like such a large amount of dishwater would attract bears. I haven't been in a few years but when I was there folks used a sink (with basins for washing, rinsing and disinfecting) in the kitchen. Because of the basins, the water use was kept to a minimum. 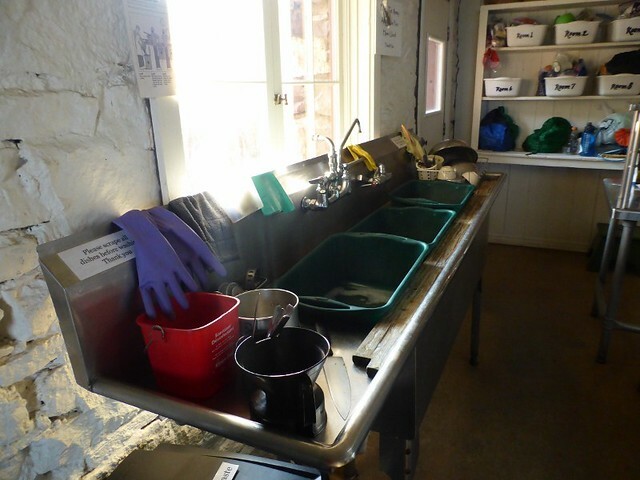 The staff took care of disposing of the used dishwater. I suspect they would NOT want people doing that themselves for the precise reason you mention! Over the years they have become much more discouraging of people doing any kind of extensive cooking up there. I remember being up there 10 or more years ago and one guest was baking a pie! Now they've moved to having folks buy disposable/biodegradable flatware from them rather than using Granite Park utensils that would need to be washed. Whatever you eat, enjoy your time up there! Thanks. We are backpackers, so we just boil water and pour it in the food pouch. Then we pack out the empty food pouch. We do like to wash our cup and bowl and spoon, however. And we do like to wash our faces occasionally. I was wondering if we need to carry a small collapsible basin for washing up. I can't remember if they had a little wash basin outside the restrooms or not. The kitchen is fully stocked from what I remember. My cohort cooked us a very nice dinner. Hopefully we'll do better at it this year, ha! The kitchen sinks are as described above. They also have a small dry sink just off the kitchen where you can brush your teeth. Early in the season there is a small creek right below the chalet to wash up in. Later on this dries up though. Each "room" is supposed to fill up their room's water jug every day from the treated water system about a quarter mile down a trail from the chalet (two 100 gallons tanks treated with chlorine). There's about a quart of water in the room jug for misc. cooking. Water bottles can be filled at the treated water station also for personal use. As far as cooking, our group usually has a big stir fry with chicken and shrimp. I bring in cheesecake for dessert. We rough it. Thanks, y'all! Very helpful information! It's a Goldilocks thing - I like to pack just right. Hate to carry unnecessary stuff. I was a bit worried how the shared kitchen would work out before our stay there in 2014. We kind of wondered if it would get a bit crazy but it worked our fine. The staff gave us a great orientation around the kitchen, water use, etc. soon after we arrived and we signed up for a time to use the kitchen. I think that three groups or families share the kitchen at one time but the stove and equipment are great and we had no problems. The dishwashing sytem has been described by others and it worked well. The link which Tibber posted has some photos of the kitchen. For Carlene and I and our two adult children we pre-ordered some food from the Chalet, namely three packages of Pad Thai for the four of us for one dinner and three packages of beef stroganoff for the following night. We also preordered two milks for our breakfast the two mornings we were there. We also took our own food for breakfast but I can't recall if it was packages of oatmeal or some cereal such as Frosted mini-wheats. We brought our own cereal bowls, some single serve coffee and a few granola bars. Everything worked out fine. The Chalet, as you may know, sells cold bottled water, soda and gatorade. I found it very refreshing after a hike. I have been told that some guests who live locally will prepare and freeze some food such as burittos before hiking in and by the time they reach the chalet the food will have thawed and be ready to cook. Granite Park Chalet is a wonderful place and hope you have a great time. Be sure to use the hooks in your room to hang your packs and others things off the floor. I did not shave there. I may not have washed my face I did faithfully brush my teeth. For general neatness or to keep them away from rodents? llholmes1948 wrote: I did not shave there. I may not have washed my face I did faithfully brush my teeth. You met the minimum requirement, although my dentist claims that he only brings floss when backpacking. That's a bridge too far (groan), imho. Small rodents. This was also the standard advice for staying at Sperry Chalet. That is not to say that the rooms at Granite Park are unclean. They are broom swept and we found them to be remarkably clean. However these are stone buildings with stone walls and a lot of crevices. We did not see any rodents but one night before I went to bed I noticed a couple of dead flies on the floor beside my bed. When I got up the next morning there were only wings left but the bodies of the dead flies were gone I don't know what happened during the night but it wasn't me. If you use the bedding at the chalet (which was very good and adequate), I would advise you to be sure that the sheet and blanket do not hang down and touch the floor as it might allow creatures to access your bed. Also, do not hang anything to dry on the Chalet clothesline unless you watch it. The mule deer are not timid and seem to be quite adept at raiding the clothesline. And of course, do not snack in your room. Eat snacks in someone else's room or in the dining room or outside. Hope this helps. Swiftcurrent Lookout, Swiftcurrent Pass and Grinnell Glacier Overlook are great hikes to do while staying at Granite Park. To answer my own questions, there are excellent facilities for washing up at the Granite Park Chalet. This info is gleaned from my stay there on 7/30/18 - 8/2/18. For washing dishes, pots and pans: In the kitchen, the chalet crew places three buckets of warm water in the sink. The first bucket has soapy water and a wash cloth. The second bucket has a chlorine-based disinfecting rinse. The third bucket is a final, plain water rinse. There is a drying rack next to that. The gray water goes to a tank located I don't know where. These wash buckets are available at breakfast and dinner times. For washing faces, brushing teeth, etc. : There is a sink in an adjacent room. There is a push-button warm water dispenser and a soap dispenser. Again, you don't have to worry about the gray water - it goes down the drain to the tank. The crew also provides a large (5 gallon?) dispenser of boiling water for coffee, tea, oatmeal, etc. 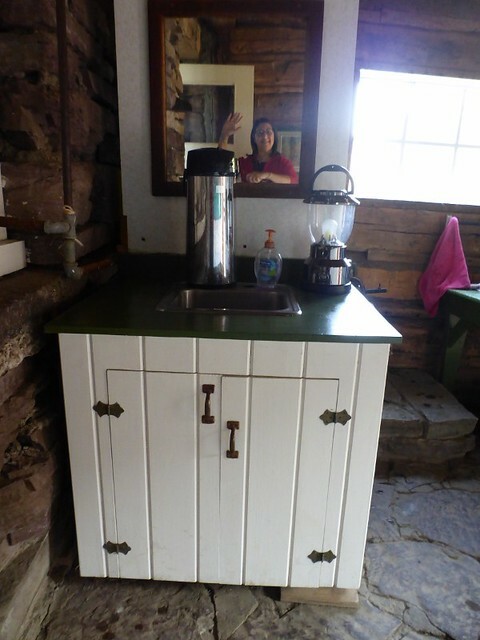 So, while you do need to fetch your own water from 1/4 mile away, you only need to get enough for drinking and cooking - the Chalet provides water for coffee, doing dishes and washing up. Really nice! I like your selfie at the sink. I used to do that before selfies when I was touring old houses or indoor tourist attractions and such years ago. Anyway I agree, the facilities are certainly sufficient altho the kitchen can get crowded at times. I didn't feel crowded until Glacier Guides showed up with a group. They pushed my stuff into a corner to make room for their large water dispensers and elaborate food. They also took over most of the prep area to make a pan of homemade cheesy muffins, said the grumpy and envious old lady.